Thanks in large part to the generosity of a group of donors from Coquille, we were recently able to add the Coquille City Herald to the Historic Oregon Newspapers website, covering a time period between 1883 and 1894. The earliest issue currently available from this weekly paper is from September 11, 1883, while the last one is from December 11, 1894. More issues will be added later from that time period, as well as from the rest of the paper’s run through 1917. Incorporated in 1885, Coquille remains a relatively small town to this day. These issues of the Coquille City Herald offer insight into the town’s early days and neighboring areas, featuring not only recent news related to the area, but also plenty of ads for some of the local businesses and trades. 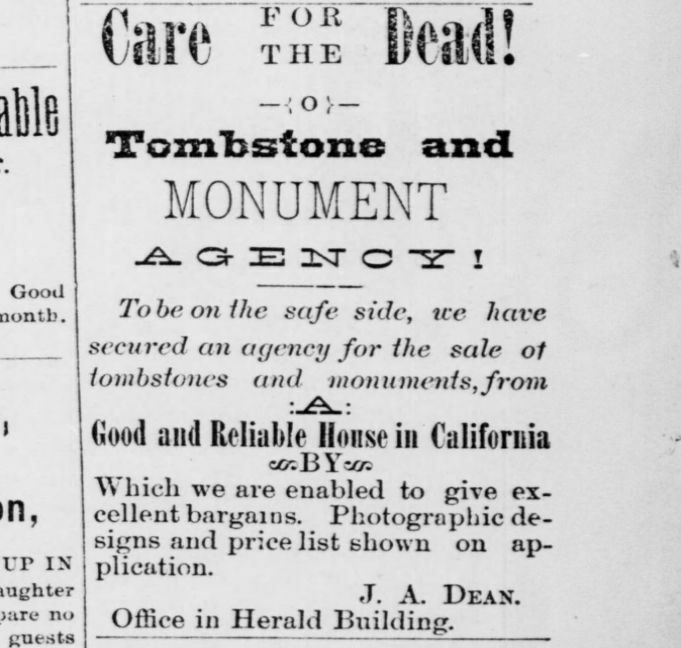 In fact, the paper often promoted the city itself in an attempt to help its growth, emphasizing the natural charms and availability of reasonably affordable properties. Coquille City herald. (Coquille City, Or.) January 4, 1887, Image 2. Interestingly enough, the property agent listed in the ad for the city is J.A. Dean, who was also the publisher and editor of the newspaper during this time. In fact, Dean was also one of the incorporators of the Occidental Water company, which was created in 1885 to transport water into the town for its citizens and business to use. His dual roles as newspaper man and property agent likely worked well for him, as the paper afforded him a mouthpiece with which to encourage others to move to this “blossoming” city. As with all historic newspapers available on the Historic Oregon Newspapers website, each of the Coquille City Herald can be browsed and searched by keyword, thanks to optical character recognition (OCR) technology. In addition, this historic Coquille, Oregon, newspaper can be downloaded as a PDF or JPEG file and saved for future reference or research purposes at absolutely no cost to visitors to Historic Oregon Newspapers. So, check out these newly added issues and learn a little more about late-nineteenth century Coquille! Coquille City herald. (Coquille, Or.) September 29, 1885, Image 4. I am so pleased with the work of this program and the associated website. 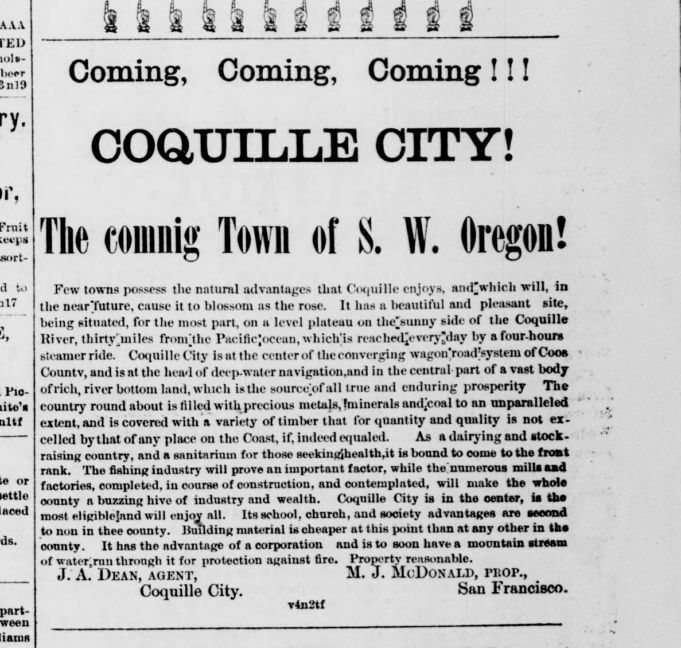 UO staff have been great to work with and the web access to my historic hometown newspapers (Coquille) is wonderful. It provides unmatched access to unique historic information supporting my work with local authors and museums. This program is an incredible tool for writers, teachers, scholars and history buffs.